Whovians unite! 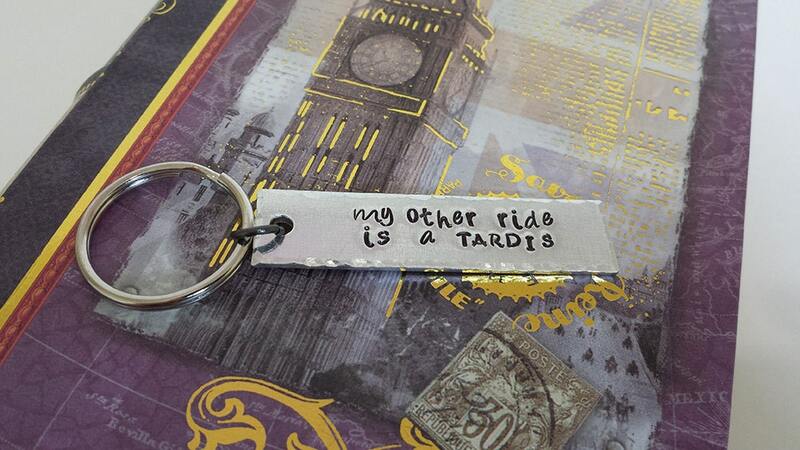 Show off your geeky side with this hand stamped aluminum keychain fob displaying the quote "My Other Ride is a TARDIS." The key chain fob is made from a 1/2" x 2" rectangle of 14 gauge (~1/16" thick) food-safe aluminum. The letters have been darkened with patina. It comes connected to a 25mm (~1") stainless steel keychain ring by a 7mm split ring (not pictured). Currently, the photo features a gunmetal jump ring, but I have moved to the small split rings for more support/stability. All of my items are handmade and made to order, so each piece will be unique. While I do my best to match the product picture, your item will have small variations that give it a life of it's own. If you would like a custom message on your key chain fob, please put your request in the comment box during checkout. What does the Texture (Inside Opt) dropdown option mean? This dropdown option covers two customization options: Texture and Inside Stamping. Since Etsy only allows for one dropdown variable to adjust price, we have to use this one to cover both our small upcharge for fully hammered texture as well as inside cuff stamping. The Texture option is first and is either "No Texture," "Edges," or "Fully." "Edges" means that you want the edges of the cuff hammered and "Fully" means you want fully hammered, which is a small upcharge (currently +$2 USD). The Inside Option, (+Inside), means that you wish to have a message stamped on the inside of your cuff. This is also a small upcharge (currently $+2.50 USD). Bracelet cuffs should be around 1" to 1 1/2" smaller than your wrist. You should be able to slip the cuff over the side of your wrist and turn it into place. If the cuff is too small, you will need to open and close it constantly, and it will eventually break from the strain. You can measure your wrist with fabric measuring tape OR measure a string or strip of paper after you have wrapped it around your wrist. Our aluminum jewelry will not tarnish, but sometimes the coloring in the letters can fade through wear. This is easily fixed by using a black or colored permanent marker like a Sharpie. Fill in the faded lettering, allow to dry, then use a cloth or paper towel with a small amount of rubbing alcohol to wipe away the excess ink from the surface. It was smaller than I expected but I like this size better. A perfect pressie for my whovian friend :)) Thank you!